With its fresh lemony fragrance, Kwik Dust Mop Treatment cleans wood floors, furniture and paneling. Spray it on a mop or dust cloth and it's ready to work. 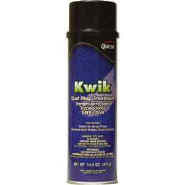 Kwik leaves surfaces free of dust, lint and hair.